I've had a busy week with showing my replacement the ropes, finishing off assignment, trying to have a goodbye drink or two with work colleagues then driving home. I've just finished the Oral presentation. Link below. Off to bed to sleep for a long time. This week i've been mainly concentrating on the final production of the projects, updating and cleaning up my CRJ, still working on the WIP, looking at the images and seeing if any more can be made form the image that i already had. The lake was stiller one day on my journey out to internet land, so i stopped of and did so more double exposure ICM. I like the last image with the subtle water effect at the bottom and the landscape slowly coming through the clouds at the top of the image. It doesn't really fit that well with some of the other images in style but it's still in concept of familiar yet unfamiliar. I'll put the card back in the camera and add these double exposure image with another image, multi layering and see if anything happens. I'm learning to work with the images and learning how to put them together, what will work and what won't, every now and then just a random ' lets see what happens with this image' works well. I looked at the images and tried to make images that would have a strong line within them. These images work well and create a sense of landscape upon immediate gaze but require further exploration and inquiry as the image doesn't seem to be the landscape that we are told to perceive. In conclusion i've enjoyed this module and project, the project born out of necessity, the journey exposed to me without realising it was happening, i'm glad it has as i've enjoyed it for the most part, at times it has become very tedious, and tiring. The thought of another drive out to upload images would sink my shoulders at times but the journey would soon pick me up and make it all worthwhile and it would remind me that i'll soon be driving another route, one thats not so sublime. The landscape would be different overtime which kept the interest peeked and inspired. I take another journey next Friday back to the Midlands and home. Which i'm really looking forward to, feels like i've been away for too long, missing friends and family and familiar setting. Until then i'll keep doing the journey to get the internet till the modules complete. I'm planning on handing in next Wednesday two days early as i'm travelling home on hand in date the 24th, great timing there... and with the internet issues i've had i want to have a days grace incase things don't load properly and i have a day to fix. I like to be a bit forward planning just in case. I've been looking at my images and noticed that there's a light and dark connection appearing in the styles. This reflects the beautiful surroundings instantly visible to the eye upon visiting here, but underneath the beauty hides a sinister environment, one of death and tragedy. This awareness has been highlighted by the collaborative conversations i have with the local people who live and work here, the story being told of the land, they are only too aware of the tragedy. The tourist images portrays the splendid beauty in all its glory for people to admire and aspire too. Images like this are found everywhere within the Lake District, on advertising in brochures, flyers, websites, travel agents and also on memorabilia , postcards, momentous to be purchased and taken home as a validation that i was once there. These images only portray the beauty at a certain moment one that is very fleeting, yet this is sold as what you will see when you come here, but the Lake district is full of bodies of water for a reason, it rains a lot. It does not look like this very often. I'm not taking any image for over a week as i'm concentrating on the publication, exhibition and general hand in work. There are a few images in mind that if conditions are right then i will grab camera and venture out but i need to focus on the other things, i think i have enough images to be working on for my WIP. I made a postcard to leave at the pub and BnB for advertising the exhibition and to be used. Being a tourist destination i thought it was a good way to advertise my work. Postcards are a fading tradition and as i'm in the tourist industry i thought it appropriate to use a postcard to send the message out. This week in production week i've had a go at making a zine, if i get a bit of free time i might run a few up and leave around the bar and bnb. I really enjoyed making the zines, if i was nearer a town i would get some A3 size paper and make them a bit bigger, A3 would make the zine postcard size. I could do that next module as i have a A3 printer at home. Above are two example of the Zines i made from A4 paper. Each one has 8 different images. I've put them out on tables at the bar and it has created dialogue amongst people which is great. People have been interested in the work i'm producing and they all it's different and interesting. I went out on route and shot some in camera double exposure and ICM. This means instead of shooting single images and then combining them in the image layer setting the double exposure consists of two consecutive images shot next to each other and combined automatically in camera, so i have to think carefully about the two images taken. In the other process i shoot singular images then combine them, sometimes combined in situe on location so i can see how the image works or doesn't and take more images or as i keep the images on the sd card i can go back and create more images later on. Here are the results of todays shoot. Down the pub using there internet and having a beer, i guess there's some benefits of having to go out to use the internet. The pub internet has given up again, too many customers using the already slow satellite broadband so i'm off to the car park again. It's so frustrating. I can see the use of ICM for creating a little blur which gives a more painterly impressionist effect, i like this style. I like the bek images below, the soft textured effect making a more impressionist images, where a photography has traditionally been known as recording an accurately view of the world, by using techniques such as multi exposure and ICM photographers can create creative styled images allowing the viewer to question and interpret the image, I don't think this impressionist style fits with the rest of the images i'm producing with this project, the blurred effect goes against the recognisable layered images but i will carry on experiment and i will definitely use it in my next project. I'm enjoying and liking the effect this creates, I've been looking into different style of photography and the process of image making and in the book by David Ward "Landscape Beyond" A journey into photography has a few good points to make. Having read through this weeks tasks i haven't got the time to do a workshop with my current working/study pattern, with an imminent move about to happen in a few weeks it wouldn't fit in with my schedule. I would however like to make workshops part of my living, i have a little experience before of workshops from my BA and working with my old lecture on a primary school workshop in Cornwall. I really enjoyed the experience and found it a alternative way to teach than the classroom. If i did a work shop on landscapes it wouldn't be based on the golden hour or misty water images. I would want to teach people how to see textures, patterns and get creative within the landscape challenging the idea of traditional landscape style of photography, using different techniques like double exposure. I would explain my technique of how i become closer to nature. A slowing down of the body and mind, i find it's a sort of meditate state i go into to be able to see the world different. I look at the big vista then go deeper and deeper into the land. Getting on with my project I put my images up on the wall to look at this week, as it's getting nearer to deadline date its time to start thinking final WIP images and oral presentation. First i put them on the wall and looked at them, left it for a few days with more studying the images, just letting them sink in really, no major thought process just letting the images speak for themselves. I then put them into groups as there seems to be a collections of styles coming through. There is a collection of images which have a distinctive line or layering in them and i like this style, the other group images i find to be messy and distracting. I was also aware that there wasn't enough for the WIP not enough that i would be happy with anyway. They were starting to look to similar. So i started more research. I came across On Landscape a online photo magazine dedicated to landscape photography. There was a lot of multi layered images photographers and articles about the different artist and their style and influences. I found this magazine really insightful and a useful source of artists. The work of Valda Bailey is featured a lot, she's said to be one of the leading multi images photographers emerging along side the likes of Doug Chinney and Chris Friel. I resinate to Valda and Dougs work more than Chris's, i find some of his work is too dark but some are very interesting with a painterly impressionistic style. All the artist use ICM Intentional Camera Movement with the multi layered images, i like this style of image as it creates a more impressionist style of work than a direct record of the view, as i started from a painting background with influence of abstract and impressionist artists like Monet, Turner and the surrealist Salvador Dali I prefer to create images using my own interpretation, imagination and creativity than creating a direct copy of what's in front of me. I can make a recording of the view by using the known landscape techniques, but the challenge is in creating something thats not there or doesn't exist, an image that only i can see, no one can replicate my work as only i can see it in my creative mind. So in my current body of work i'm creating new landscapes by blending the two images together from a recognisable, tourist and iconic landscape. I'm challenging the idea of tourist images, like in the last module, the image i produce could be marketed to the tourist as art pieces still used as that momentoe of the visit but a more creative art piece than the usual tourist tat mass produced items on sale in every tourist destination. Theres a market for all types of momentous and souvenir to match different pocket allowances. Heres some images i've taken this week. Multi image made from single images, i find this didn't work as the one image of the sheep is blurred giving a poor quality look to the image, but the composition i find works for me. I like the shot but i won't use it as it's poor quality. I started to experiment with in-camera double exposure as opposed to multi layered image process done in camera adding ICM to the images too. I'll put the image on later as i can't download anything where i'm living and its starting to drive me up the wall, it's so inconvenient for this kind of studying. I'm spending so much time driving to the area where i can access 4g and roam it over to computer is very time consuming. I will be glad when i do the rest of the degree from my parents home with easy access to internet and resources. Here has been a experience for me personally in a new environment and i have met lovely people who i will keep in touch with after i leave and i love the chilled out lifestyle but for studying online distance learning is not practical. I knew i couldn't download or watch lecture/webinars but i didn't realise how much i do use it everyday. I have to make a list of things to add on and do it in my car on a car park in the next village. As i believe everything happens for a reason this procedure gave me the foundation for the project. A journey into Place, identity and time. I've been thinking about the images i've been taking and why? I'm trying not to take the tourist image and be more creative with the image. I think i'm managing that, for a start of they aren't taken at the top of a mountain depicting a landscape conquered from the challenge of climbing the mountain, like most of the image out there in articles, tourist advertising and marketing , postcards, cards and other tourist memorabilia. There are some galleries and craft outlets that are showcasing local artist and the rise in this is become more popular with new craft cafes opening up. As my work is being guided by the journey i take to and from the carpark for my internet access as Alexander states "
Much landscape photography inevitably requires travelling to particular locations to make work. Sometimes, however, the journey itself is more important than the destination, and the means of locomotion(walking, driving, taking the train)is its integral to the creative strategy of the project. (Alexander,J. 2015) this gives me reassurance in my strategy towards my journey and photography undertaken in that journey. How many of the people who walk these mountains only take the picture of the view at the top and don't record the journey to get there, the pain, the sweat, the breaks, the little details that tell the story of the journey, just the image to say look what i did is more important. or maybe its because the journey up there is tenuous and needs all your concentration and hands might be full with walking sticks to keep your balance or scrambling, or is it that people don't value the journey enough to be recorded only the end result? The mountain top view that took all that hard work to attain is shared on the social media pages for all to comment on what a fantastic view it is. Before social media and the internet these images where printed off upon returning home, admired and memories recalled once more before they were put into a family photo album to document another achievement or just simply put in the box with all the others to join in the family memory collection. Lenman wrote"when tourists return home , their photography's become complex mementoes, evidence of a journey that condenses a multifaceted experience into a set of discrete rectangles to be sorted, shared and organised into an idealised narrative. As in the 19th Century, some narratives may take the form of carefully edited and captioned holiday albums.Many more will remain structureless and loose in shoeboxes or envelopers or, unprinted, on cd's, doomed to be forgotten or discarded. (Lenman, R, 2005) why take them in the first place if not to use? The video lecture with Victoria Forrest was very interesting and informative. It gave me a lot of new things to think about in the design process of making a book. After learning more these past few weeks about exhibitions and book publishing it's moving me more towards a book than exhibiting. I think they both have a good purpose to reach audiences but for me currently i think a book is more of a challenge. Having exhibited before i know a little about it, i know theres always more to learn but i feel a book is a totally new area for me to look into, explore and develop. After the lecture it made me think about my work and how i like to produce image that are still worked on after the image has be taken and processed. I like the layers in the work that this produces, for me printing an image is never the end. It can be used for so much more. Like fabric printing which can then be made into endless things. I once did a body of work where the printed images where fixed onto a handmade personalised frame with resin, this process slightly discoloured and distorted them, you never knew how the images where going to react. After the resin had dried the whole piece was covered in spray varnish so the images become permanently fixed in the frame instead of using glass to protect them. You could polish the piece like a piece of furniture. I exhibited the piece during the Rhubarb Festive at the mailbox in Birmingham, I still have the 5 frames and one day i'll make them into a table top. I've been exploring the idea of embroidering or felting onto a finished image printed onto canvas, this idea straight away bring to mind a gallery setting as canvas being generally hung on the wall as a picture but how about making the images smaller and putting them in a book. Like the old school wedding books where they are fixed inside two thin pieces of card one this will allow me to create the images and put them in a book myself, i would just have to order the books. How do incorporate the two ideas of a book and fabric images needs further investigation and experimenting. Victoria allowed me to believe that its possible with creative thinking and design. I just need to explore and maybe get experimenting on pieces. In my current living situation i'm unable to do this but from September i'll be moving back home which will enable me to have access to my sewing machines, a mother who is an experienced seamstress for advice on sewing techniques and will free up funds due to living back home. The work i produce will be costly and require time to experiment, so i've had to think about living requirements, space and costs with work balance if this is what i want to explore. Victoria showed me how to use key points in the body of work to gently unfold the narrative. I already have ideas coming to mind, like make only 3 books, each one designed around the 3 different location it will also make it very unique as i will only print 3 special additions. Each book can have different elements relating to that area, for example at Iford Manor, The Peto garden, the Italian pillars are very reminiscent and a icon of the place so i could draw a pillar and use a repeat pattern on the inside of the book as the backing of the front cover page so when you open the books every cover is different, each of the 3 books will have a different design from each area, but the main body of work will be the same as the project covers the whole of my journey from Wiltshire, Cumbria and back to the West Midlands. Every detail is though about and linked back in context to the body of work. This will be important in my final piece to allow the story to be told. Back to my practice i've changed from telephoto lens to wide angle this week to get a contrast within the image the weather has also changed to cloudy with the odd drop of rain, dropey as the farmer calls it. We've been going through a heat wave and the forecast for rain is very minimum, here in the lakes that's unusual. The bnb has it's own water supply from the mountains, it's collected in 3 big drums which are fitted in the mountain and fill with rain water and is filtered upon entrance to the building, the water supply is starting to run low due to no rain fall in nearly 6 weeks now and the little bit of rain we've had this week won't do much to top it up, the hotel and Inn down the road who have the same system has already run out abit, no car washing for us. The change in weather gave me a new inspiration for my images, the constant from sunny weather made me think about how i wanted different weather conditions to show through to contrast and compare what the landscape looks like. I want to show the land in all its weather fronts unlike the traditional tourist image which only shows sunshine and golden light. I've noticed that you really notice the clouds here as you're surrounding by hills in a valley, it's really noticeable in contrast to living back home in a suburban environment, the level of the cloud is easily marked on the hill sides. It creates a very moody atmosphere. Looking at my previous images from previous modules i'm starting to see the seasons changing through in the images, just from different locations around the UK, this brings another theme into the photography work. Seasonal change through the landscape at different tourism and visitor attraction and locations around the UK. My next project will be covering autumn and winter back home in the West Midlands at Himley Hall and park a public park and stately home ran by Dudley Council, the park was once the stately home to the Earl of Dudley, once visited by Prince Edward who abdicated the Throne to be with Mrs Simpson. The home was in it's hayday in the 1920's where it housed an indoor pool with a slide, now it's turned into a dinning room for weddings held at the house. This park holds a lot pleasure and memories for me and it's the place for my renewed interest in photography in my late 20's. You can really see the difference in the weather change in these images and how the cloud hangs around the hills at different levels at different times. It gives another line to the landscape, one that is very fleeting giving an atmospheric feel to the location and a welcome contrast to the big blue sky and constant sunshine we've had of late. I've included the building in the area as theres not that many being remote, they are a big part of this landscape and community so i feel they need to be included in the project. The Herdwick sheep are an integral part of this landscape and are your companions as you go about the land. You feel like your in there garden. The ridge on top of the hill creates a great line great layers when using multi layers. I look for this when taking images. The line of the land changes with the weather. My strategies for landscape photography is i don't use a tripod and i don't go for golden hour or misty water style. Multi exposure photography is nothing new. Examples can be traced back to the very beginnings of photography, where a light sensitive material has been exposed twice, overlaying one image on top of another. It seems likely that this ability to create layered exposures was discovered by chance, as a result of a mistake, forgetting a slide had already been exposed. In recent years, the resurgent interest in 'Lomograhy', especially amongst young photographers drawn to the retro nature of shooting on film using low quality cameras, often from Eastern Europe and toy cameras, has seen multiple exposures images appearing again on photo sharing sites as they experiment with the effects that can be achieved. For those who love just put, classic photography, you may be thinking multiple exposures are probably not for you, However, you may find some of the features, especially in the new top end canon which you were having to toil away in photoshop. The feature is not just for quirky or artistic and creative photography by any means (Chinnery 2013). I'm not a purist photographer and use the medium as a creative outlet for me to experiment with and be creative. It's not just a tool for depicting the view as accurately as possible, for me it's a means for which to show myself through, as a brush, paint and canvas is the showcase to a painters mind, the cameras is to mine. Having thought about my image making, i got thinking about the methodology of what i'm doing and why? This question came about due to my frustrations brought about by fatigue and working schedule. My initial plan was to go off and do walks in the land as this is a fell walking country, upon reflection it doesn't matter what the journey is. In my last project i strolled over to the Main garden from the Orchard, i've journeyed up from the South west and now my journey is through nessesity. The need to have internet takes me out of the valley and the image are from that journey our a period of 8 weeks. This is the view from my car in the car park i drive out to to access the internet in a village called Gosforth. Similar to Long i was to make photographs about nature and the journeys i take within the landscape, were a Long makes a mark by walking and then photographs that mark which then disappears, i look for the marks made by others or naturally formed within the landscape. During the journey i look at the landscape admiring like a tourist might at its magnificence and contemplate at its structure, the lines made by history and the changes that i see in the weather. As i become more familiar with the land i visualise images that i think might site together in the multi layered process. Creating another imaginary landscape that i see before me, creating a more artistic interpretation of the land. Looking at other photographer Dan Mountford who use multi layered images, Unlike many artists who use double exposure photography in their work Mountford is an analogue guy. There is no digital manipulation going on here. Most of his images are created in the darkroom, in the old fashioned way, by placing one negative on top of another to develop a third image, where as i use a digital camera and do the work in camera with little manipulation in post production. His image evoke a sense of fairytale narrative with the architecture, nature and human presence and like Rolander he leaves a lot of blank space around the main body of work creating a frame. I'm drawn to Rolanders work more than Muntons, the black and white creates a platform for the textures he used within the human form, the composition of the figures are enhanced with the use of the chosen foliage or brick work. Caroline Frasers work uses the land and i find her work very emotive giving the sense of a minimal calm landscape, this style is contrast to my bold full images of the active landscape. I don't seem to be able to see the simple here i just see big and full vistas which is reflect in my images, but i like the idea of trying to simplify the images to become more abstract and minimal. I'll explore that more in the next project. A selection of my image to contrast with Carolines. As you can see her images are simpler in design elements with a slight abstract impressionist style as opposed to mine which are very factual, elements of the environment are still present so we can recognise the image as a landscape image but on closer inspection and exploration the images isn't what it first seems. The double exposure blocks out parts of the one image, either allow or covering up the other image. A ghostly or shadow effect occurs which creates a type of effect as if the paper on one page has been ripped to show the layer underneath. My images are still reminiscent of a landscape that upon gazing we immediately recognise but something not right which draws you further in and around the image looking for signs of something to recognise. The narrative is questioned and then slowly answered or sometimes slowly lost in the fading nature of the layers. I'm manipulating the landscape and cross pollinating the environment to create my own world. "A visual journey through our minds, in quiet, where the reality of the everyday life does not come"
I've been told by the locals about the Abraham brothers who are wellknown climbing photographer of this area. The pub where i work have the wall displaying black and white images from the brothers. I sit under the watchful gaze of George Abraham the local famous pioneering mountaineering photographer of the area. Reflecting on this weeks topic of Exhibitions brings to mind an exhibition i was part of in Birmingham with Rhubarb-Rhubarb photographic festival. They were exhibiting and advertising the launch of Rhubarb farm an online exhibition gallery for photographers similar to Landings 2018, for the advertising they used the for-sale billboards on the side of vacant offices and warehouses in the Jewellery Quarter, Birmingham. They used the usually plain for-sale sign to showcase the images for sale on the site. The guest lecturer with Nhung Walsh was very informative and showed that exhibitions can be showed and created in many different formats for different audiences. I've thought of doing an exhibition using my photographs printed onto fabric and made into a textile art piece and hung outside to see the effects nature would have on the piece over time. As the work is based around nature, environment, place and time putting the final pieces back into nature seems like the circle of nature. This project would need a lot of thought and health and safety would be involved if hung at a tourist attraction. Just an idea to think about for major project. Looking at my images i'm starting to see how i'm challenging the notion of what the landscape is? This is my interpretation of the land i see around me. As i go about this valley and surrounding areas the shops and galleries are mainly full of the traditional landscape which i view as the tourist image. With my images i'm mixing up the landscape i see to create another unfamiliar landscape. Some image still have some recognition within them and some are abstract in their design, familiar yet unfamiliar. My strategy is to look for images that don't replicate the traditional landscape but to seek out the detail and patterns within the land. Within the landscape lines, shapes and patterns are formed either naturally or man made. A quote which is used a lot around here, is 'A living, working, landscape' mans impact is evident even in the remotest or barren vistas from the worn paths up to the summits to the fell walls to show farm boundaries. Up until now i've been shooting with a telephoto lens enabling me to get into the landscape and extract the detail of the land, i'm going to change and put a wide angle lens on and shoot wide vistas. As i keep the images on the sd card i'm hoping to mix the image from the when i arrived and started shooting to now. As the weather changes quiet dramatically here i want to explore the different images i can get by using the changing elements together with the different lenses. To see what images come out. I was bit late but i managed to get my work into for landings, i looked into getting a new site just for the exhibition but it would cost again and i can't afford it so i've decided to use the CRJ platform to showcase the work. I'll set a separate page and the main page as the exhibition page so when directed to the CRJ its whats seen first. There are images already on from the past two modules but i'll change them once i get some final images form this module. Textile artist Tracey McCracken Palmer creates landscapes images using wool and the felting technique, her page gives a description of the technique involved. I think i will be able to add some of these technique to my work. In this weeks module we have been thinking about exhibiting and showing of our work. I haven't really had time to think about this so i will give it some thought today as i'm off from work, but my initial thoughts are arggghhh. I did speak to a local gallery as i was in the gallery having coffee when i read this weeks tasks and to hire the gallery our for a week is £200 giving you the whole space. I haven't the fiancées for that and i wouldn't have enough work to fill the walls and the cost involved in doing that, so this brings me onto thinking about doing an online exhibition as it would limited the costs. I will research into this a bit more. Having thought about and looking around at what is about the local area i've come to the decision that online will be most affordable and manageable within my current circumstances. The local pub where i work at night has a big turnover as it's the only Inn in the area. I can put flyers on the tables with the menus, guiding them to the website for the exhibition. The flyer can have small thumbnail images and the date, web address and brief strap line of what it's about. I'll ask permission from the manager and i could do the same at the BnB, the gallery and a few other establishments around the local area. I'm not very clued up on online exhibiting so hopefully next weeks tutorials will give me more information about doing this. I don't really understand the group exhibition so maybe i need to read through all that again and the workshop i don't think ill be able to do, with my work schedule and location. As my work involves tourism connection, i've been exploring the idea of making a series of cards/postcard to sell at the tourist places i work and around the local area. They've been explaining the sheep to me, Herdwick sheep are the traditional variety that live on the Cumbria fells. More information can be found on this website below. I tried to do some abstract water images at the shore edge but they didn't work out how i wanted. The water was to ruff for what i wanted. I'm usually drawn to water to create images but the land is so dominate here i think i'm pulled away to focus on the land. This week we've been thinking about non human photography. This i don't really get. As humans have created the camera even if another being use it it's still at some point being connected to another human being. I understand the interest in the area of research and debate but i'm not interested in this area. So concentrating on my project is foremost in my thinking at the moment as i've been behind due to my moving location and starting new jobs. I think i'm just about settling in and getting familiar with my surroundings. Thinking about this modules project about place and identity has got me thinking about why i move about and maybe it's coming to an end. This current stage of my degree has moved on from the Peto garden at Iford Manor in Wiltshire to a project based on place and identity in Cumbria, they are both tourist destinations and it seems that my work is directed around this industry, and the choices i make within that sector with job and location choices. This gets me thinking about images that are associated with these industry. I choose places of work that i find interesting and want to explore and learn more about. When i first arrived here i was concerned about how the project would move forward and i'd planned on going for walks into the land and take image of that journey, but that doesn't seem to be the case, i have only ventured out towards the back of the farm so far, due to work commitment, energy levels and the fact we are going through a heat wave and it's really too hot to be walking at midday which is when i have my free time, the heat and work schedule has given me a case of heat exhaustion. Working in hospitality within the tourist industry i've seen many images based around the tourist gaze, the images found around the area are all designed and marketed for the tourist. They want to take home a momentous of the place to validate and confirm that their experience was taken, whether to show others of their holiday or for their own pleasure of collecting souvenirs and momentous to gaze upon and reminisce of times gone by. I want to challenge the idea of the tourist picture postcard image. "I am very wary of the picturesque picture, i get satiated with looking at postcards in local newsagents and at the picture books that are on sale, many of which don't bear any relation to my own experience off the place.....The problem for me about there picturesque pictures, which proliferate all over the place, is that they are a very soft warm blanket of sentiment, which covers everybody idea about the countryside....It idealises the country in a very unreal way." Fay Godwin. (Alexander, J. 2015) like Godwin my experience of this environment will not be of a picturesque picture, it will be experienced through hard work from working within the land and experiencing it everyday. Life here is not a picture postcard so i want to create images that are from this land but don't resemble this land. A landscape that is familiar yet unfamiliar, creating a land that doesn't exist which is made up from my imagination, interpretation and creative vision. The Lake District is renowned for its picturesque quality and beautify scenery. It is a very popular tourist destination. The strategy for my current project is to learn more about this environment and how its changed over time and take photos of the people in their environment going about their work. I still want to experiment with multi images as i like the style it gives to the image, creating a layered story in one image. Showing the way of life here and how the land is used, historic land references from the past, geological formations and weather patterns. All these images will be merged together to create a narrative of place, showing its identity over a period of time. I'm up early as the farmer woke me up, 5am. So thought i'd make most of the time whilst it cooler, we are in the middle of a heatwave to take some pictures. The mist was out this morning so i snapped a few shots but thought about what Gary said yesterday about what are you taking them for, what are you trying to say? I don't really know was the answer i just felt that i should be taking some images as i haven't taken many. Upon realising this i put down the camera and opened laptop to write, think and do some research. I research other artist in the area to see what kind of work is being produced. Came across Ian Lawson a cumbrian photographer who has made a book called Herdwick. Looking at his work his images are very picturesque, very much aimed to the tourist buyer who wants a picture perfect memory of their visit. Another body of his work The Shepherdess is created in a more commercial advertisement brochure style. I don't like this style when trying to depict her way of life, he's made the images to glamorised and has idealised the shepherdess lifestyle, he's done a fashion photo shoot to advertise this way of life, a made up one to please the viewer i think more than to document her lifestyle. It's too commercial looking to tell me a story of her life, i feel it's trying to sell me her lifestyle not show me. I want to stay away from these kinds of images and create a piece of work that question what you're looking at? 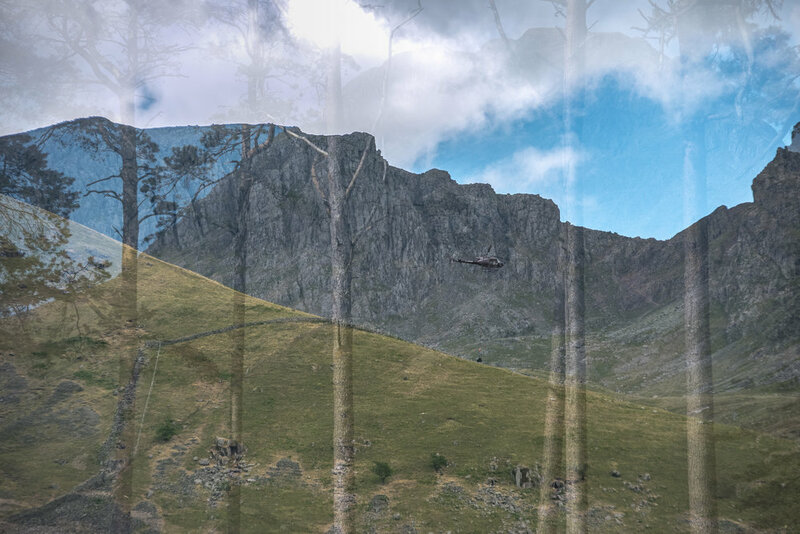 Moving forward from the last module the technical strategy is the same, i found the relationship between multi layered images worked well and i think in this landscape setting the layering will hopefully create some interesting narratives within the image. I'm still learning about the multi layered double exposure technique and how it can be used. I will download the images from the camera to laptop as i go but i will not delete them from the camera sd card as i want to experiment with the different images from different times. It's a journey into time differences on the camera. The weather is one key distinctive part of this environment, it rains a lot apparently, so this is one element that i want to experiment with by merging them together to see what effect can be create. By keeping the images on the camera over a period of time i will be able to mix image from the beginning of my journey with the end, as within the landscape here you have a merging of times, element of the past can be seen today which creates the identity of the landscape we see and recognise around use and gives the Lake district its characterisation. I'm creating this notion of time passing within the single images and brought together in the final multi layered image replicating the landscape layers of past and present seen in the tourist gaze today. I'm Collaboration with the family about the way the land is used around here, it's history and traditions. This will inform the way i look at the land. As you can see from the images above i started to document the life around the farm, i didn't like this result and after conversations with the family, some weren't to keen on being photographed. I asked about shooting the shearing of the sheep which they said yes too but on the day, stress levels were high as a few things weren't going to plan for the farmer and his daughter so i was told not to bother them as it's too stressful, with this information i've decided not to photograph them and change strategies, i want to keep the harmony as living and working here it's important to keep things on a happy level. I spoke to them about the wool which is sent of to the wool board, they don't get a lot of money for the wool as herd wick wool is mainly used for carpets as its courser than other wool used for clothing. Talking to them about the wool and how its used got me thinking about how i could incorporate it into my FMP (Final Major Project) I've been thinking of printed images onto fabric and make something with these, creating another layer into the image, i thought that maybe i could get the wool and embroider it into the final image, representing the Herwicks in the environment. Looking at another artist who uses textile surfaces is Helen Sears. Questions of touch and the experience of surface are central (as they are for many painters moving toward photography). Moreover the series Inside the View (2005), also involves the presence and absence of lace. It is a suite of combined images which on one level contribute to the long history of montage. In each work a portrait and a landscape are brought together to generate a third meaning. Sear also produces a third image out of this method. The two photos are combined on a computer screen in Photoshop. Onto the image of a woman’s head, Sear ‘draws’ a lace-like network of lines in which emerges a photo of a landscape. In painting and drawing the line is usually there to form an image. In Sear’s work the line is the image. The network becomes a veil to look at and to look through. It is difficult to tell if it is really ‘there’. I like the idea of putting an extra layer to the final image another layer representing the complex way of life and landscape here. I asked if i could have some wool and to see if i can get it spun into wool myself on a course. They said they have bags of the wool around so help myself. I also thought of felting the wool into the image, i've used this process before and this type of wool would be suitable for it. I will be experimenting with these techniques later on as i don't have any space here to do anything so it might be a case of taking it home after leaving here and working on things there. I've put these ideas in my ideas page too. I've had a bit of a busy week and i'm writing this a week later, i've moved jobs and locations, from Wiltshire to Cumbria. Visiting home in the West Midlands in between. I've moved to the Wasdale Valley on the western Lakes in The Lake District, Cumbria where i work and live at Burnthwaite BnB www.burnthwaitefarm.co.uk. At the farm you have the Farmer Andrew and his partner Georgina who runs the bnb, his daughter Helen who is learning farming from her farther and her partner Gaitan who works at the local inn, where i also work 3 nights a week. The geological topography of the landscape is immediately visible upon arrival in the valley, i felt immediately drawn to making images of the landscape that you would see in the tourist industry advertising the location as the area is so picturesque. The images would be easy to come by if you point and shoot your camera anywhere as it's such an inspiring landscape and so picturesque, but i don't want to take those traditional styled landscape images. I find traditional landscape imagery doesn't hold my interest for long, and the endless golden hour images, misty or still waters a bit repetitive. The tripod and long exposure stops me in my tracks, i prefer an immediate response to the environment not one where i wait for the right light, weather and/or conditions, i want a more reactionary response to the land than pre thinking and planning what the image will be. I'm also a lazy landscape photographer, getting up before light for the sunrise is not for me, i've tried and failed many times. If i was paid to get up to take an image i would and could. In hospitality i have to get up very early for breakfast shift because i have to as i'm being paid but the thought of doing it just for getting the image isn't enough to drag me out of bed, even though i find nothing finer than the early morning which is quiet and peaceful with not many souls around, the world waking up and i have witnessed it on many early morning journeys to work, but the early morning landscape photographer i am not. When reading about Landscape imagery the photographer is always very keen to show and explain the hardship that has gone before to make the image. For instance the work of Thomas Heaton in his ebook Landscape Photography on Location start of 'It's 4am; my phone is ringing and vibrating under my pillow. I am still in a slumber and my subconscious has not separated dreams from reality, the alarm seems distant and unreal, then i wake with a start. I force myself out of the warm, safe, cosy sleeping bag, unzip my tent and peer out into blackness. I can see cloud and i can see stars, game on.' He goes onto explain the journey of the sunrise golden hour photo. I've read this kind of account on many occasions and it now seems to be part of the landscape process, if you don't suffer for your art then it's not worth it, it seems to add to the image quality. I find it's some kind of competition for who has the worst experience bagging the shot, but it's becoming half of the experience that makes the shot even better. I won't be camping out at night on a fell side or summit to get the dawn shot. Does this mean my images aren't any good? I want to be creative and interpret the land in my own creative way using the multi image process i've been using, whilst settling in i've been thinking about my project and where its going to go. Place and identity within the picturesque. My aim is to capture the local landscape showing an identity of the environment which is unique to this area. I guess this covers landscape documentary reportage. The place is a pictoraque landscape with so many images depicting the landscape, but since i've been here i'm learning about the place and the people who live here and work the land. I'm asking questions about the land and how its managed, it's such a contrast to where i've come from. From a quick look at the module and sharing, i'm sharing my work with the new people who have come into my life, we are all learning new things from the collaboration. I've been collaborating with the farming family and the people who live and work within the landscape. The people who know and understand the land and see it differently to tourist or visitors. Collaborations to me doesn't necessarily mean collaborating with another artist, it's whoever enhances and informs your work and inspires you. I'm experiencing their lifestyle even if for only a few months. First set of images taken from around the farm and a little walk out. Upon arriving at Wasdale i looked at the landscape and was immediately struck by how lunar the landscape to the right of the valley was. The fell walker, guide book author and illustrator wrote. The patterns that the scree has created from falling down into the lake create line in the landscape. I've noticed that there are many different lines in this landscape. Lines from the scree, from walkers treading the land and fell boundry walls. The scree lines are made naturally by weather conditions and natural erosion occurring over time, the paths are trodden down by mans foot creating scars across the land, these lines can be seen from far away showing the way to the summit, a reminder of our need to conquer the great outdoors and the fell walls are another man made mark upon the land, these walls were put up due to the Enclosure Act which was introduced in the 1700's, Slaves or prisoners were used as man power to make these walls upon the fells. I was told by the farmer that the wonkier the wall the older it is, straight walls have been built more recently. As i drive past these walls and look at their design i wonder who build them? As you can see from these images above, the first shoot i did, i was drawn to the texture within the landscape, there are a lot of lines with the landsape. I'm reading Jesse Alexanders, Perspectives of Place, i'm reading it cover to cover and i'm finding it very useful. The book has useful exercises that i've yet to undertake but as i'm doing the degree i don't think i need extra work. I'm in the process of moving again, the job and where i live isn't working out for me, so i hand my notice in, pack my things and move on, I've got a job in the lake District, `Cumbria UK. I've wanted to spend time in this area for a while now so i'm gonna go and see what happens. It's only till the end of the season. Where will this change in locations take my photography practice? It's a big change and risk i'm taking in doing this as i had my project set out, but then i'm not a person who sits still and has life run smoothly, where's the fun in that. She says having anxiety attacks. Yes, i have fears but i'd rather be facing fears and moving forward than sitting still. My health has been affected by this position and its one of the main reasons for my move. I can feel the difference within me and it's not good or right for me, so i must move on and seek pastures new that will help me gain my health and physical well being back. For my photography practice my straggle will be to wonder out into the land and walk around my new environment and capture things that are drawn to me. The longer i'm in the environment the deeper i go into it and find the details within the land. This requires patience and a slowing down of mind and body to allow the eye to focus on the details. I'll have to take in to consideration moving adjusting time and new job expectations etc but the wonder with the camera will be a relief and meditation for the other stresses i've put upon myself. I move around with my job in hospitality mainly within the tourist industry, this brings the question of travel and tourism images of the places i live in. The tourist gaze is directed to features of landscape and townscape which separate them off from everyday experience, Urry, J (1990) when we go on our travels we want to experience a different way of life than we experience everyday. We choose our places to be gazed upon because there is an anticipation , especially through daydreaming and fantasy, of intense pleasures. Such anticipation is constructed and sustained through a variety of non-tourist practices, such as film, tv, literature, magazines, records and videos, which construct and reinforce that gaze. Urry,J. (1990) Living and working in tourist destination brings this notion to the forefront as i think about landscape images and the tourist gaze. The gaze is constructed through signs, and tourism involves the collection of signs. When tourists see two people kissing in Paris what they capture in the gaze is 'timeless romantic Paris'. When a small village in England is seen, what they gaze upon is the 'real olde England. This is the same for the Lake District. People aspire to the idea of outdoor adventure when they see image of rolling fells basked in golden light, or a misty waterfall or meandering bek. They gaze upon the image and imagine what they will do and how they will feel once seeing and experiencing this for themselves. People linger over such a gaze which is then normally visually objectified or captured through photographs, postcards, films, models and so on. These enable the gaze to be endlessly reproduced and recaptured. The Photography of tourism does much, though obviously not all, of the work of making tourist sites iconic, while tourist photography usually emulates and reinforces the photography of tourism (Faulkner 2010). Looking at the traditional landscape/tourist image i don't want to copy this style, I want to explore the area and create images that question the notion of tourism images in an iconic landscape. I want to create something different that creates a question and enquiry about the landscape not just a reaction of wanting to visit the place. As part of an introduction into Mod 3 Surfaces and stratagies Gary gave us Ed Ruscha to research. I enjoyed looking into Ed Ruscha, he's a cool guy. I was immediately drawn to the book 9 swimming pools and a broken glass. I've had a fascination with swimming pools from an early age, from learning to swim, having a fear of a whale in the deep end of my local baths to just being near a body of water for exercise, pleasure, meditation, relaxation and fun. When i saw his book i new i would be able to create one of my own as i have taken photos of swimming pools for a very long time. These images consist of holidays, and from places i've lived and worked in hospitality;ity or my work for private clients. I seem to be have worked at a lot of places with swimming pools in them, probably because i look for work with leisure facilities in them so i can use it as part of the work package, i previously used film usually in disposable cameras or underwater cameras and more recent digital. I looked into ebook publishing and it was a bit of a mind field, so i went for a quick option i have used before which was photobox, it's an online main stream printers which is easy to use to do one off prints so i printed a small book. I'm pleased with the outcome, i would edit a few images out now seeing it after printing. The Swimming pool and skateboarders is a nod to the American 70's skateboarders and The Red Hot Chilli Peppers who used to use empty disused swimming pools as skating bowls. here's a selection of images i put together for the swimming pool collection, i knew i had some images from an outdoor pool that i really liked but i couldn't find them anywhere until i had printed the book. This is the final book printed. Heres the extra images i would have liked to have put in.